Additional agenda items we will discuss include community involvement and the future direction of The Chicago Silverlight Users Group. About The Speaker: Scott Seely is the president of Friseton, LLC (www.fiseton.com), and is a Microsoft Regional Director. From 2002 to 2006, Scott was a developer on the WCF/Indigo team at Microsoft. Today, he is an active member of the .NET community in the Chicago area, helping lead the Lake County .NET Users’ Group, organize Code Camps, and speaking at user groups throughout the region. Scott has focused on distributed systems since 1995. Dave Bost discusses Windows Phone development at The Chicago Silverlight Users Group. There was a lot of buzz and a number of great announcements at last month's MIX10 event in Las Vegas, especially around Windows Phone 7 and one of its development platforms, Silverlight. 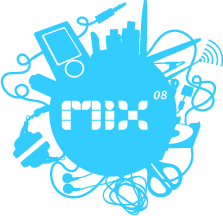 Register now and join The Chicago Silverlight Users Group this Wednesday, April 7th at 6pm where we'll review and discuss announcements and demo content from MIX10, including Windows Phone 7! The Chicago Silverlight Users Group meets on the first Wednesday of each month and focuses on Microsoft Silverlight, WPF and XAML design and development. Don Burnett points out that the Silverlight 2 Developer Reference poster they passed out at MIX08 can also be downloaded via Brad Abram's blog here. Also, don't forget to check out the cool DeepZoom version here. Thanks Don! I had the chance to chat briefly with Pete Blois from the Microsoft Expression team about this week's announcements regarding Blend. He pointed out that there are 2 new versions of Blend now available: Blend 2 Beta and Blend 2.5 March 2008 Preview. He recommended only using the 2.5 Preview when working with Silverlight 2 projects and sticking with the Blend 2 Beta when working with WPF. I will be installing both versions and have a comparison review of in the coming days. We're finally seeing a cool new use of Microsoft's Photosynth technology in the Worldwide Telescope, a virtual astronomy application that trumps Google Sky in user interface and wow factor. Much like the 3D photo collages we've seen from Photosynth, users are treated to a virtual version of the universe. The technology combines images and feeds from telescopes and satellites, and weaves them together to create a comprehensive view of space and beyond. Check out the video from yesterday's TED conference. 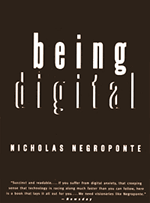 Being Digital by Nicholas Negroponte. A history of media technology and predictions for the future, this 1995 collection of Wired articles was required reading for me in college. 13 years later, Negroponte's remarkably accurate insights and optimism for the future renew my own hopes for the promise that technology can and will make a better future for us all. A First Look at Silverlight 2! 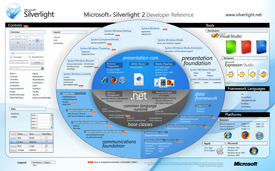 In anticipation of MIX08 in March, Scott Guthrie has posted his First Look at Silverlight 2. If you haven't registered in time, you are too late. MIX08 is now sold out. Luckily all the sessions will be recorded and posted to www.visitmix.com following the conference.